If you're wondering what sets us apart, here's a few pillars of our business. If you're still on the fence, give us a call. Our team will clarify any of your concerns about switching. Today more than ever, businesses place a high value on personal relationships and verbal communications. The telephone remains their single most important communication tool, and they are increasingly seeking advanced features to empower their employees and to ensure they can be easily reachable by both clients and prospects. You can rely on our managed service to enable your company to take advantage of the latest communications features and technologies. Kinetech’s voice service is designed from the ground up to deliver high quality calls and continuous availability. Each customer system continuously feeds real time information back to our network operations center. Centralized monitoring and highly automated troubleshooting provides automated problem detection and correction, drill down diagnostics, and centralized management enables Kinetech to deliver the quality of service needed by today's discerning business customer. Kinetech's service allows you to focus on running your business-and not on running your phone system. Installing an IP-PBX on the customer premise allows Kinetech to remotely monitor the health and performance of each location from the Network Operations Center (NOC). 24X7 monitoring and highly automated troubleshooting allow Kinetech to deliver the quality of service needed by today's discerning business customer. For example, in the event of a major utility outage, your voice traffic will be automatically re-routed to an alternate location to ensure uninterrupted service. We pride ourselves in the experience and expertise we bring to the table. It can be difficult to find a service provider who cares more about your business. That's where we excel. Supporting our customers is our first and last thought every day. Our U.S. based local service and support team is there to assist you with all of your questions. 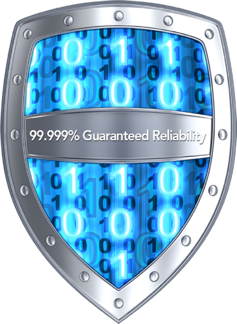 This has enabled Kinetech to enjoy an over 99% customer retention rate! Voice-over-IP (VoIP) technology represents the future of voice communications and phone systems. VoIP services give businesses the tools they need to operate at a highly efficient level. 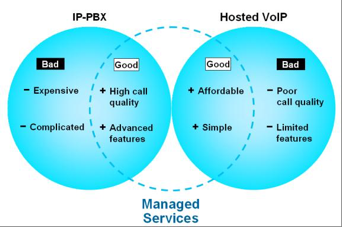 Premise based IP-PBXs have a rich set of telephony features, but are both costly to implement and complicated to operate, usually requiring a dedicated staff and expensive maintenance contracts. Hosted VoIP solutions (including those offered by Telephone and Cable companies) are simple and cost effective to implement, but are not fully managed end to end for quality and reliability. Kinetech’s Hybrid Business Solution delivers a Managed Voice Service with the simplicity of a hosted solution and the quality and feature set you expect from a sophisticated in-house phone system- the best of both worlds. Kinetech’s solution was designed from the ground up for the business market, with the specific needs of your business as top priority- from quality and reliability through around the clock monitoring and support. Our technology seamlessly connects headquarters, branch, remote, and home offices and provides extension dialing throughout the business and one number access. Calls can be seamlessly forwarded to remote phones and cell phones using find me-follow-me. This enables staff to always be in touch and communicate as if they were in the main office location. One of the key features of our offerings is focus on portability and mobility. With seamless integration from desk to mobile, you'll never miss a call again. 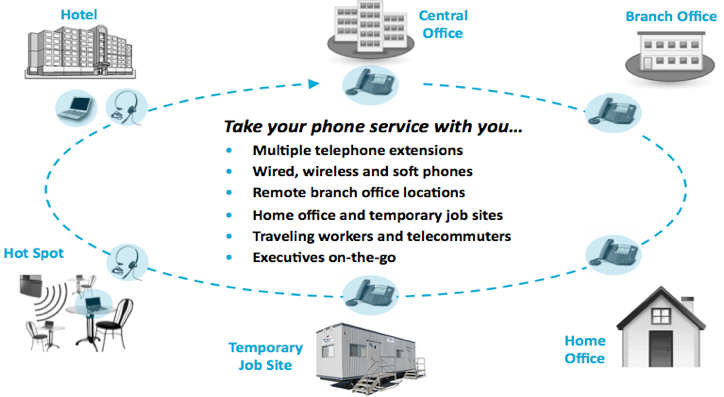 Use an iPhone, iPad, or Android Device with our Mobility Service Application to make and receive calls on your business telephones system.